It’s rare that a plant is named for the part of the body it can benefit, but that’s the case with eyebright. In fact, this common name for Euphrasia officinalis comes from the fact that its often used for the eyes. Topically, we like eyebright because it is a natural cleanser, and can help skin to appear tightened and more refreshed—just what we want for that thin, fragile skin around the eyes. Eyebright has long been used to treat eye conditions. A small plant only about two to eight inches high, eyebright is an annual common in dry pastures and in chalky soils in Europe. 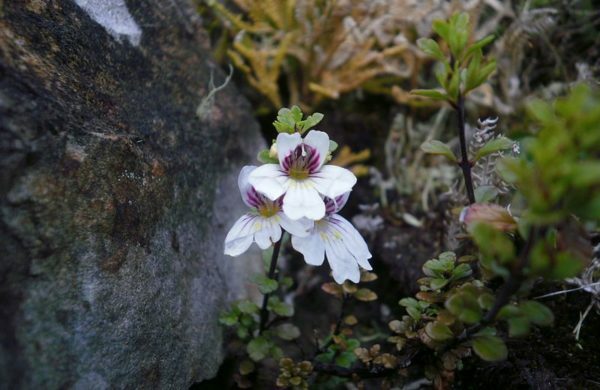 It can grow in rocky areas by the sea or in the mountains, though it will be extra small there, or may thrive in richer soils where it can spread out more and grow up to eight or nine inches high. The stem is erect and wiry, with many opposing branches and small leaves no more than a half-inch long and about a quarter inch wide. The leaves are toothed, while the flowers are in terminal spikes similar to the foxglove. The lower petal is shaped like a lip, while the upper one has two lobes shaped like arches, forming a shelter from the rain. Flowers may be white or lilac and purple veined with a bit of yellow, and bloom from July to September. Purple areas on both the upper and lower lips point the way down the throat. To create the extract, the plant is gathered in its fresh state when in bloom, and cut off just above the root. The leaf, stem, and small pieces of the flowers are all used. Herbalists have long used eyebright in poultices to relieve eyestrain. Modern day naturalists also use the extract mixed with water to create an eyewash for treating eye infections, inflammation and pink eye. Eyebright may also be taken orally to treat things like hay fever, allergies, the common cold, and inflamed sinuses. Eyebright also has tannins, similar to those in tea, that help decrease inflammation. In foods, eyebright is also used as a flavoring ingredient. What we love about eyebright is its ability to calm and soothe the feeling of your skin around your eye area. It’s the perfect ingredient in formulas that aim to make eyes look more awake and youthful. Reduce the appearance of puffiness: You can make eyebright tea, then drain the leaves, allow it to cool, and place on the eyes with a soft cloth or cotton pads, leaving for 10-15 minutes. For oily skin and clogged pores: Eyebright helps to protect the skin around the eyes by unclogging pores. Cleansing: This means that eyebright tightening the look of skin, making it appear more smooth and flawless. This is great for the under eye area, and also works well over the rest of the face, particularly on the nose and chin where pores tend to appear larger. Antioxidants: Like most plant products, eyebright contains antioxidants in the form of flavonoids that protect the skin from environmental stressors. Over time, this action helps reduce appearance of fine lines and wrinkles. Of course, we included eyebright in our Anti-Aging Eye Cream. Try it and see if your eyes don’t look more awake, refreshed, and youthful. Do you use eyebright? Please share your tips. Photo courtesy Rudolph49 via Wikimedia Commons. A biochemist said at his lecture “Eyebright formula”: add one drop ‘eyebright’ to 10 drops water.Cataracts will fall off….!!!! I just recently found eye bright when I came down with a double eye infection virus this past winter. I used a tincture along w/ taking olive leaf oil and oil of oregano internally. I had no idea it would be so beneficial for the skin. I’m going to try adding it to my facial cleanser. Thank you for sharing this.